All talk, no action! You know these people; they make promises or talk a lot and never accomplish anything. It sounds like the guy who says, let’s get together for lunch, but never calls you. Some may think of this person as a people pleaser until they realize it is all talk. They love the positive reaction until you realize it is only intentions. You can do do something about it. The cure is simple! Although I think it is self explanatory, I am including some synonyms for your amusement such as all foam, no beer, all hat, no cattle, all sizzle, no steak, and all hammer, no nail. These are words usually associated with politicians, but don’t think it is always someone else. Those of you who have joined health clubs, resolved to lose weight, tried to get out of debt, tried to change spending habits or just tried to break a habit should identify with it too. You can do something about it! If the intention to get something done, you have to take action! Most people who fall into the “all talk, no action” group are trying to look good vs. measured based on accomplishments. What they do not realize is they lose credibility. They are trying to please, but they disappoint others and themselves. If you are trying to change, you have to start with yourself. A more effective strategy is to hold yourself accountable for your wishes and turn them into goals. Change is difficult and you need to start small. I am accomplishment oriented and there are things where I fall into the “all talk, no action” group too. Some may call it procrastination! I want to clean out the garage, but don’t! I say I will start small and quit after two weeks. It is one of the only goals, I have difficulty addressing. How will I overcome it? I need a new strategy. Maybe you do too! It reminds me of New Year’s Resolutions. Why wait for a particular date to set goals. After all, most fail! Stop making announcements – It reminds me of school announcements every morning, although those are intended to pass on information. When you announce a New Year’s Resolution, you are declaring to yourself and others your intentions. In most cases, you are not held accountable for the intentions. Or results. For example, I want to lose some weight and I am starting on January 2nd. Probably no one will call you on it when you do not lose the weight. Look for praise or admiration differently – Most people who make these announcements are looking for attention. Positive attention will come when you achieve your goal. When I los t weight thirty-six (36) years ago, I received a great deal of positive attention after I accomplished the goal. I remember going skiing and my friends commented (positively) when I was in the Jacuzzi. Measure your progress – As you measure your progress daily or weekly, you can find your motivation to keep going because you are achieving your task or objective. You can receive encouragement as you make progress. Use it to keep going to your goal. Become more results oriented! Make changes as needed – If you are doing anything, you will experience setbacks, failures and misses. Successful people overcome or work through them by making changes. Sometimes you just need to stay the course, but often you need to make small changes. Give yourself rewards – It is a great way to become self motivated. I often create small rewards to get things done. I prepare lists and just cross of items, but sometimes I need more motivation. I might give myself a deadline or a quota. It is my way of playing a game and competing with me. Whatever works is a good strategy! Stop making excuses! – Excuses do not help you achieve your goals. You may be trying to take on the big goals right away and fail. If you are trying to pay off huge debt, weight loss or some other big goal, you need to break it down to bite size tasks. What can you do on a daily basis to achieve your goal? If it is debt, what spending can you stop to have extra money to pay off your debt. Small changes work and there are no excuses! Take action! Success breeds more success – Start small and you can succeed! Small successes will get that admiration, you are looking for. Small successes will help you break down those big goals and help you reach bigger goals. All talk, no action is attention getting, but not as good as results. You can make changes and get much more by actually achieving results. You need to hold yourself accountable and measuring your progress is a good start. “Well done is better than well said.” (Benjamin Franklin) What are your expectations? If you set a goal, do you expect to achieve it? If you do, you need to actually do what is necessary to achieve it. The answer is simple, just do it. All talk, no action is a broken promise! People who talk but don’t follow through quickly lose the trust of the people that they are ‘talking’ to. This is true in personal and work situations. I have a family member who has consistently promised to do a variety of things for family members, and it’s a running joke (with sad overtones) that nothing ever gets completed as promised. I think we all know of people like this! I often thought it was a southern California problem, but it certainly not limited to Los Angeles. The saddest people I know are those that need attention for just attention. It would be hard to always live that way. What an unfulfilling life. Accomplish something and then if you need to let others know, then at least you have done something or just be satisfied knowing you have done it and it doesn’t matter what others think. Plus if you have a goal, why not start today instead of waiting until the start of the year. 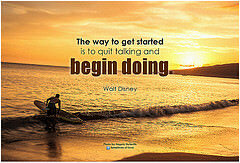 If you really want to do it, then start now. When people talk about what they will do, it reminds me of something my mother told me.She would consider what they said as a way of bragging. She always told me to let my accomplishments speak for me. I think she was right! Small successes can really be important for longer-term success. I know that for myself, when I get those early wins, it bolsters my confidence and resolve to accomplish a goal. With respect to money, this can come into play in many ways. Just two examples: having good short-term wins at work (income), or eating all meals at home for a week (saving). Small changes and achievements encourages you to try more things. If you use small daily tasks to achieve your goals, you will can achieve your goals.The reverse of breaking down huge goals into small tasks makes it much easier to reach your goals. Mistakes are not a bad thing! If you are doing anything, you make mistakes. They only remain mistakes if you let them be.